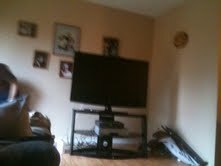 Well just bought a new HD TV from Bestbuy. It is an LG 46 LCD 1080p it is really nice and everything runs so smooth on it and shows look great. At the moment though my 360 is the only thing that is HD on it. But that well change soon enough when we buy a Rogers HD box and subscribe to an HD package. It was a great package deal got the TV, stand, and in house pick up warranty for $1100.